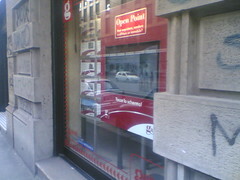 Or, as I’d like to say: starting the innovation of the real estate market; Gabetti Open Points are interactive windows we started spreading through italy. They’re a 24h/7 Gabetty agency where you can search for an house or office, simulate your loan, and leave your data to be contacted by an agent. These interactive shop windows are built using a supercool fanless hush computer, a 32” Nec LCD screen and a touch-sensible ultrathin film that converts the existing glass window into an input device. Even if the technology isn’t so cutting edge I’ve never seen something similar applied to a shopping experience, moreover if we talk about real estate business. There’s an interesting effect that we observed as more and more of this open points appear in our shops: the Observers or – as my boss likes to say – the “Broken Window effect“. When you use one of our Open Points immediately a huge crowd becomes visible on your back: curious people that have never ever seen something similar: a shop window that can be touched to interact with a monitor. WOW. If you leave in Italy (or planning a trip to) be sure to leave a comment here below. We’re starting with a promotional initiative that involves the Open Points and a mass market distribution firm. you could try these machines and also win a 150.000 euros worth prize. This entry was posted in Beef and tagged application, gabetti, real estate, starting-up by admin. Bookmark the permalink. Sto facendo una tesi sul digital signage e mi interesserebbe avere qualche dato in più su questa case history italiana.